Global personal property recovery is a reality in the internet age. With the help of a Good Samaritan, who would think that such a simple webpage could hold the answer to recovering lost personal property anywhere on the planet with an internet connection? To a Good Samaritan, password-protected, portable electronics are nothing more than fancy paperweights. With our uniquely numbered, commercial-grade asset tags, all a Good Samaritan has to do is go to our webpage, enter the number on your item and a privacy-protected email will be sent to you. The system also has a database where the make, model and serial numbers of your personal property can be recorded. 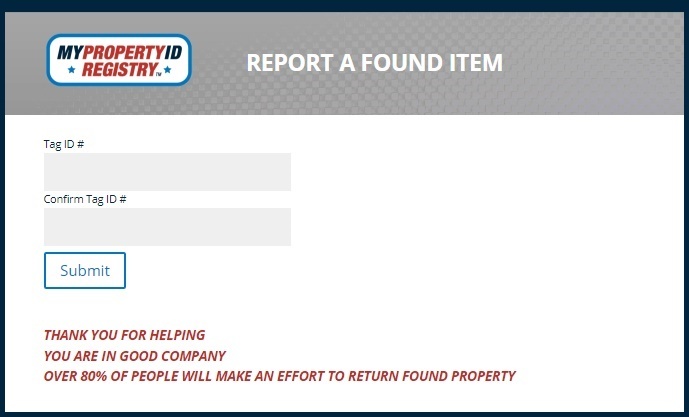 If your items are ever stolen, this is the information the police need for the NCIC when you file a police report. Without serial numbers, the police can’t help you. Remember, our system is a way for you to help the police. Whether you are in Brussels, Bucharest, Beijing, Bemidji or Bayonne, being caught with registered or marked property is like being caught with marked money. It’s solid evidence.